Another oven experiment, this time testing a Finnish recipe with North American personality. I am not a fan of cinnamon rolls, those sweet things with weird icing on top, I find them too rich and too sweet and the after taste gives me nausea. Unfortunately I am a minority when it comes to cinnamon rolls in this household, so due to popular demand “we” decided to make some over the weekend. After a bit of research, trying to reach a compromise of some sort, we decided on Finnish Pulla, a mildly-sweet roll or dessert bread with crushed cardamom seeds and occasionally raisins and sliced almonds. Other types of pulla include small round ones that resemble English scones but have a sugar and butter topping, and larger cinnamon rolls called korvapuusti so we decided to try a combination of both, made cardamom cinnamon rolls :). Now, I assume you checked my pictures already and you are at least intrigued if not downright hungry. They came out gorgeous and the taste was simply amazing, even my sister in law decided to come over and stuff a bunch of them in a bag (note: if you want to see your family more often, bake these things once a week). 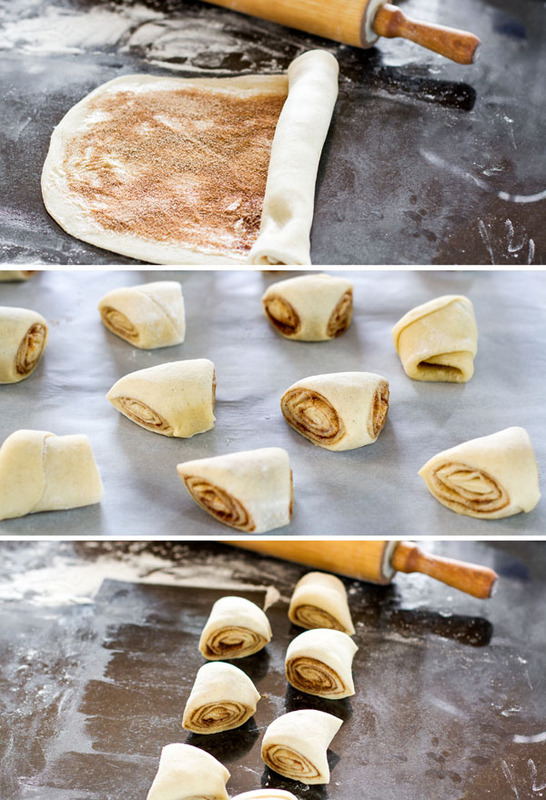 Preparation steps are pretty easy, much like any other cinnamon roll so it would be a walk in the park for those of you that have a little baking experience. For everybody else just check out my images and follow my lead… if you can :P. In short, activate the yeast like with any other dough, mix milk, sugar, cardamom, butter, eggs together until well combined and then add flour, one cup at a time until you used the whole quantity required. Give a serious swirl with the hook attachment then let rise for a couple of hours and more if you have the patience. Combine sugar and cinnamon for topping/filling. 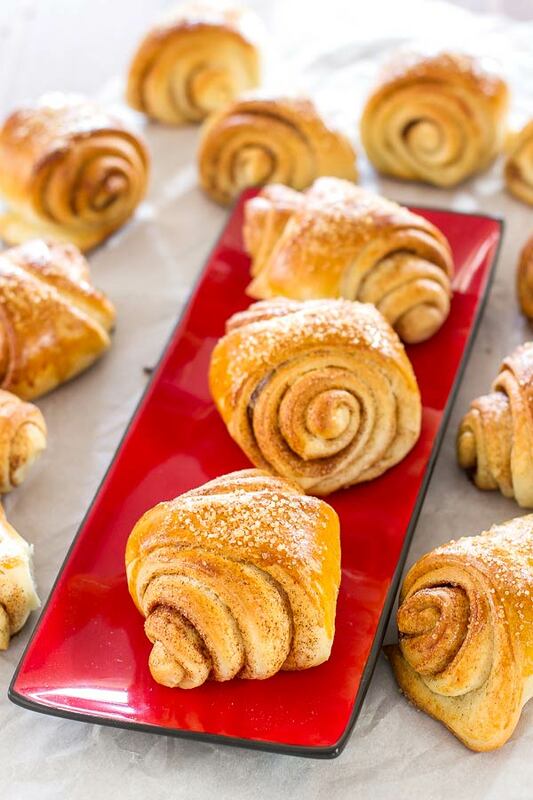 Using a brush or a knife spread some butter on every roll like you see in my images then sprinkle cinnamon-sugar over entire surface. Final step, rolling and shaping, pretty easy as well. To be honest with you, it is quite fun making them, even my dog was jumping up and down next to the island to check them out. Let them rest for 30 minutes to rise some more then brush with sugar and stick them into the oven. After 20 to 25 minutes you will end up with something like these… Forget about the coffee or milk or anything else, these can be devoured without any add-ons, the only problem would be how to stop before finishing the whole pan. As always i welcome your suggestions and/or questions, just make sure you read the recipe below carefully, everything you need to make these beauties should be there. Enjoy! In the bowl of your mixer add the eggs, stick of butter, cardamom, salt and using the paddle attachment, mix everything together. Add the yeast mixture and continue mixing until well combined. Change to the dough hook and add a cup of flour at a time and mix until you add all the flour. If the dough is too sticky add a bit more flour, but continue mixing until the dough separates from the bowl and forms a ball. In a large bowl add a bit of oil, about a tbsp and place the dough in the bowl, rolling it around so that it gets oil all over, this way it won’t get dry. Cover the bowl with plastic wrap. You need to let the dough rise for a couple hours until doubled in size. In a small bowl combine the sugar and cinnamon together for the topping. Line 2 baking sheets with parchment paper. Add a bit of flour on your work surface. 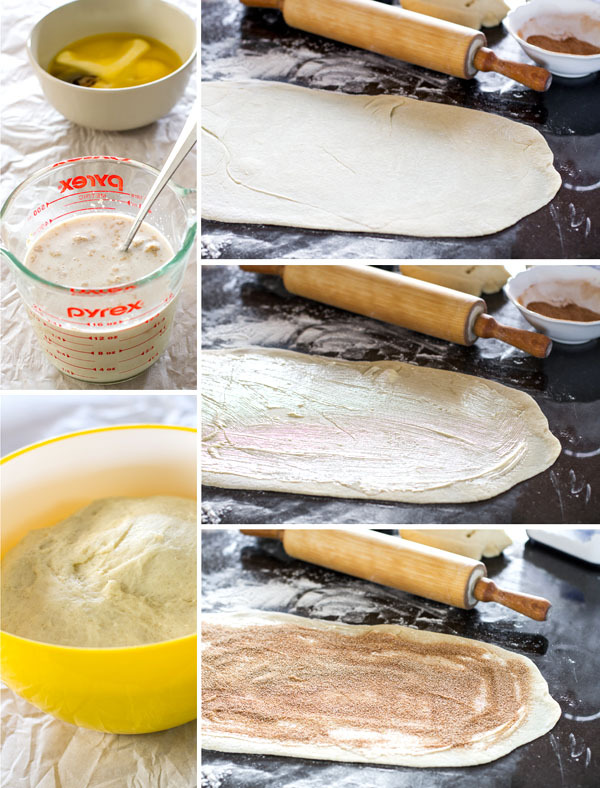 Punch the dough gently and place it on your work surface. Cut the dough in 4 equal pieces. Working with one piece at a time, cover the other rolls so that they don’t dry out. Roll each piece about as thin as you can, should be about 12 inches by 18 inches. With a brush or a knife smear some butter onto it. Sprinkle cinnamon sugar over the entire surface, as much as you want. Roll it into a tight log starting from the narrower side. Line up the dough log in front of you and cut it slightly on the diagonal, alternating up and down, so that the slices are fat ‘v’ shapes, with the point of the ‘v’ about 2 cm (¾ inch) and the base about 5 cm (2 inches). Place on the prepared baking sheet. Repeat with remaining dough pieces. Let the rolls sit for about 30 minutes to rise. 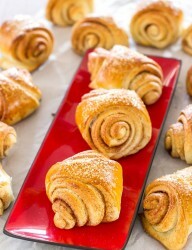 Brush the rolls with egg wash and then sprinkle with Turbinado sugar or plain sugar. Bake for about 20 to 25 minutes or until golden. Lovely recipes and blog. Can I also be added to What’s cooking group on Pinterest please ? My name is SweetAsHoneyNZ. Thanks. Thanks and you should get your invite in a few minutes. What lovely rolls and photos. Definitely need to try these. Pinned!